Scenic artist Tansy Elso tells us about her trip to New York as MTC’s 2018 Travel Award recipient. Towards the end of January, MTC scenic artist Tansy Elso traveled from scorching hot Melbourne into one of New York’s worst blizzards. As the recipient of MTC’s annual Travel Award, Tansy was sent to Cobalt Studios, and The Studio and Forum of Scenic Art, courtesy of Qatar Airways to study soft scenery techniques. Between her freezing cold subway rides, Tansy studied new methods of painting translucent backdrops, scrim painting, photo-real foliage techniques, painting from a pigment wet-palette system and also new techniques of painting stage floors. We asked Tansy about a few of the high points of her adventure. What makes Cobalt Studios and The Studio and Forum of Scenic Art leading studios for scenic art? 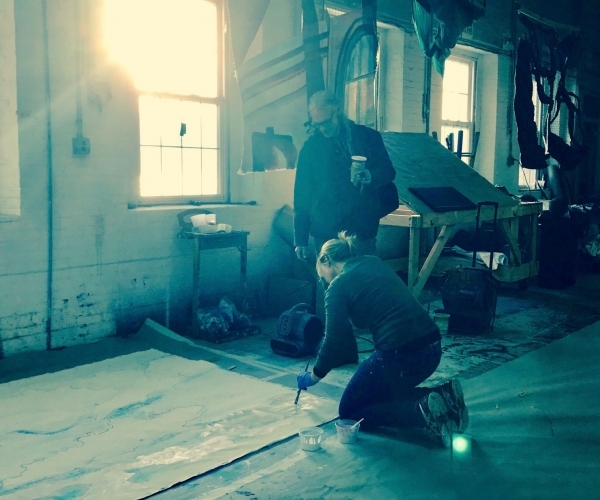 They are both well respected and established studios on the east coast of the US and provide world-renowned training for aspiring scenic artists from all over the world. As well as providing training, they are also commissioned to produce backdrops for the arts industry, also giving them an insight into the requirements of the actual industry itself. Cobalt Studios primarily runs a two year program where the students live in-house and train full time, learning all aspects of scenic art for the US arts industry. The studio also runs a variety of shorter training programs that are often taught by renowned practitioners. Studio and Forum forms part of the company Scenic Art Studios and usually provides a weekly program over a period of three years as well as blocks of special training seminars. Both focus and base their programs on traditional scenic art techniques with the philosophy that this provides a strong foundation of the craft for students to build on. Tell us some of the highlights of the International Travel Award? The International Travel Award provided a fantastic opportunity to widen my depth of experience in scenic art, broaden my network amongst my peers, experience other scenic art environments; their structures, techniques and equipment, and receive training from some of the most experienced scenic artists in the US. While at Cobalt Studios the students, including myself and more experienced backdrop artists produced four backdrops for Harvard University’s theatrical society, Hasty Pudding Theatricals. Over the two week period the painting of the backdrops allowed me to observe and utilise a number of opaquing and translucent painting techniques, the most impressive being an image of Times Square at night. We then travelled to Harvard University in Boston to see the backdrops on stage under stage lights during the Roast of the Woman of the Year, Mila Kunis. Being given the opportunity to see the backdrops on stage, as they appear in the show, allows you to learn what techniques were effective, what could be done differently and how the stage lighting affects the finished piece. At Scenic Art Studios I was given the opportunity to start experimenting with dyes to colour and illustrate canvas. Scenic Art Studios have become well known for their use of dyes as a medium for painting vibrant and richly coloured and textured translucent backdrops. I worked on a project under the instruction of eminent scenic artist, Richard W. Prouse that used a special technique they had developed to quickly produce beautiful sky backdrops. Although there are potentially a number of approaches, this particular method utilises all the unique characteristics of dyes and has become a favourite amongst the designers they work with, and it allowed me to start understanding dye’s potential. 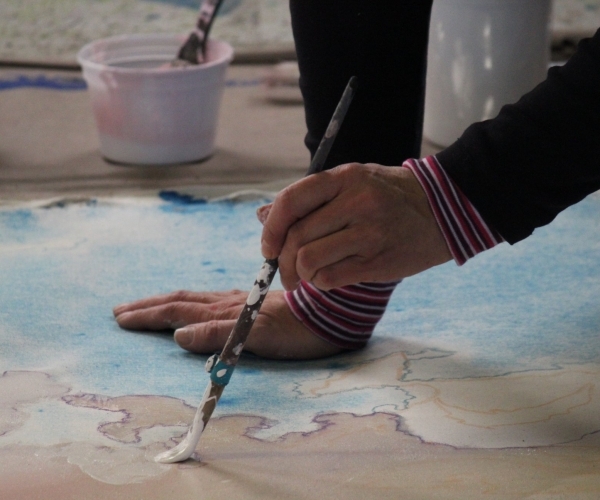 Tansy applies masking paint onto the reverse side of a double translucent backdrop. I was also very excited to be given the opportunity to tour the scenic art department of both the Metropolitan Opera New York and Walnut Street Theatre in Philadelphia. At the Metropolitan Opera I saw how the scenic art department managed the repertory nature of their theatre company and the particular demands and requirements placed on the job. While at Walnut Street Theatre, I was interested to compare and observe a similarly sized, funded and patronised theatre company, particularly how the scenic art department was staffed, managed and resourced, as well as the materials and techniques they used. What compelled you to want to learn more about soft scenery? Soft scenery has traditionally been the mainstay of theatre production but as set designs have evolved, the opportunity to develop skills in this area has lessened, and as a scenic artist it is great to be able to offer a breadth of skills. The forum of the Backdrop not only provides a creative tool but teaches the scenic artist fundamental skills that can be utilised by other theatrical devices. The way an object, texture or design is painted on a Backdrop, to be read by the audience and across distance, is often epitomised on a Backdrop; it thus provides a stage for learning and reinforces the art of painting for theatre. Backdrops are often thought of in traditional terms but they can be translated into a contemporary setting. Scenic art today has become an interesting mix of traditional and contemporary methods to bring a designer’s vision to stage. It is important to be able to deliver a broad range of theatrical visions demanded by an often eclectic mix of plays within a season. I was really interested in tackling some of the technical challenges that painting a Backdrop provided, and learning how materials I am not as familiar with behave, react and interact. These materials and processes are being used internationally within the scenic art industry so it was great to gain some understanding of these methods and their potential application, as well as how they responded to changes within the industry, including the introduction of new technologies. Here Tansy is cutting in and blending colour on the reverse side of a double translucent backdrop. What are some of the most interesting things you learnt on this trip? I was very interested in learning the techniques specific to translucent and double translucent backdrops as they are often seen as more suited to the contemporary theatre environment, which has a strong emphasis on the interplay between lighting and set elements. Thus they have the potential to provide a beautiful tool for both set designers and lighting designers. The translucent nature of such a Backdrop allows the lighting to heighten the visual appeal of an image, texture or design by the canvas drop allowing light to glow through. A double translucency provided another layer to this effect with an image merging from the back surface of the Backdrop to the fore as the lighting state changes. A drop can appear opaque or a mixture of opaque and translucent when front lit but, as the lighting state changes and it becomes backlit, the image painted and hidden from view on the back becomes visible. I was really interested to begin gaining an insight into fabric dyes, their methods of application, and how they can be manipulated to achieve different visual qualities. The dye quickly absorbs and dries so a keen understanding of what you are wanting to achieve and how this is done is needed to fully realise their potential. The advantage of this medium is that the colours have a vibrant quality and beautiful watercolour effects can be produced, and importantly they leave the surface of the Backdrop subtle, which helps maintain the longevity of the cloth. Using the repel and absorption method (similar to watercolour painting), I was able to begin to learn how to manipulate dye to form cloud shapes and skies, bleach and wipe back and opaque behind to push colours through to the fore without allowing the dye to bleed through. From combining these techniques, I was able to produce a blue sunny sky that transformed into an evening sunset, featuring an aeroplane emerging through the clouds. 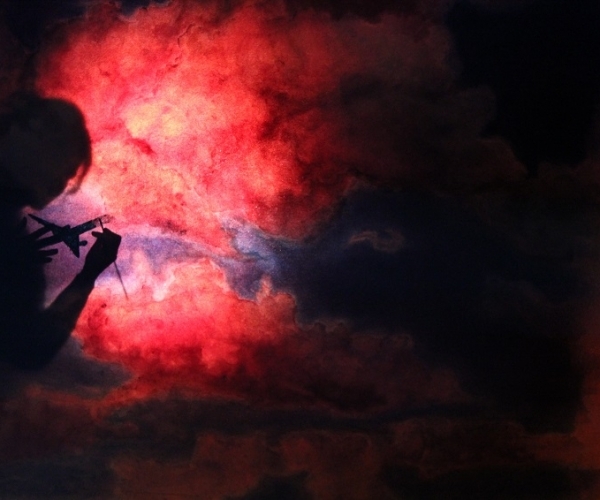 Tansy paints the detail of an airplane on a back-lit double translucent backdrop. What was special and unexpected about this trip? – can be non-work related. 1. Negotiating the New York Subway was not for the fainthearted, neither was the lack of suitcase friendly stations! 2. Trump Tower is not as impressive as one might think. 3. The NYPD drive very small, cute cars. 4. The snow was fabulous and has the ability to turn the most mundane into a winter wonderland. 5. Meeting some lovely fellow scenic artists. 6. How much I would love to learn. How did you find yourself working in scenic art and what keeps you passionate about your field of work? I had always been interested in art, but when I was given the opportunity to do secondary school work experience at the local amateur theatre company in country Victoria, I realised there was a whole new, fun side to it. I went on to study theatre production specialising in stage craft, at a tertiary education level, and eventually graduated from the Western Australian Academy of Performing Arts (WAAPA). For me, scenic art is most often about the process and the technical challenges along the way; the steps that must be taken to achieve the desired outcome not just the finished product so you have to really enjoy that aspect of the career. It is a team job not only within the individual department, but also in the relationship with the designer, the other production departments, and the individual shows. I love seeing things coming into our area at MTC and being transformed, heightened, manipulated through scenic art processes into something else. What makes the job interesting to me is being able to work with new materials, as well as the challenges, problem solving and that every day can be different. Did this travel award inspire you and your career path? How? I always value and appreciate any opportunity to work on interesting theatre painting projects and learn new techniques. By visiting both Cobalt Studios and Forum of Scenic Art, Metropolitan Opera New York, Walnut Street Theatre Company and the galleries of New York City such as MOMA, the Guggenheim and the Met, I was really inspired to push myself further in areas where I would like to strengthen my skill set. I would like to gain further knowledge in the mediums I was introduced to, and to develop some of the areas that I recognised as lacking. It was great to learn from different masters in the industry and see their varying approaches, and also to observe how the industry operates from a different cultural perspective. It’s beneficial to my own career and development that I adopt and adapt these ideas within my own context to further enhance my scenic art abilities. What tricks of the trade are you bringing home? It’s always valuable to experience different approaches and try new materials. I had the opportunity to learn different methods of priming canvas in both animal glue and starch, stretching backdrops, spraying, transferring imagery, opaquing, as well as working with materials and methods of painting translucent and double translucent backdrops. These methods of priming a Backdrop are not commonly used locally, so it was interesting to see the advantages that this method can provide, as well as the differing way a canvas can be prepared for painting. Other tricks of the trade include receiving an introduction to dyes and their unique qualities, exploring other paints such as casein that also have distinctive characters and attributes, learning to pull an image through paint, different types of equipment such as alternative sprayers and the effects they can produce were some of the variety of techniques, equipment and materials I now have an understanding of. I was able to learn several methods of producing a translucent Backdrop, and I started to understand the potential way a double translucent drop could be utilised on stage. How much does Melbourne differ from New York’s scenic art world? The New York and United States scenic art world is significantly bigger than that of Melbourne, being called on to supply the many productions for on and off Broadway, colleges, the film and television, as well as the arts industry in general. A large number of the scenic artists working in the industry belong to a governing organisation that admits members based on successful completion of competency exams. This provides the work force with employees that can supply a certain level of proficiency and skill suitable to the style of productions produced within the US. In New York, the scenic artists are largely classically trained either having completed training courses or been part of an apprenticeship program that is often run by the various studios or the aforementioned governing organisation. Because of the size of the industry there are far more employment opportunities either working as a casual scenic artist or as a employee of a studio, college or theatre company.